On the last Sunday in November, Lopburi's population of monkeys - a lovable nuisance at other times - are treated to a proper feast courtesy of Yongyuth Kitwatananusont, the owner of the Lopburi Inn. Tables are laid out in the grounds of the San Phra Kan and Phra Prang Sam Yot shrines, covered in red cloth, and filled with fruit, vegetables, soda, ice cream and sticky rice. 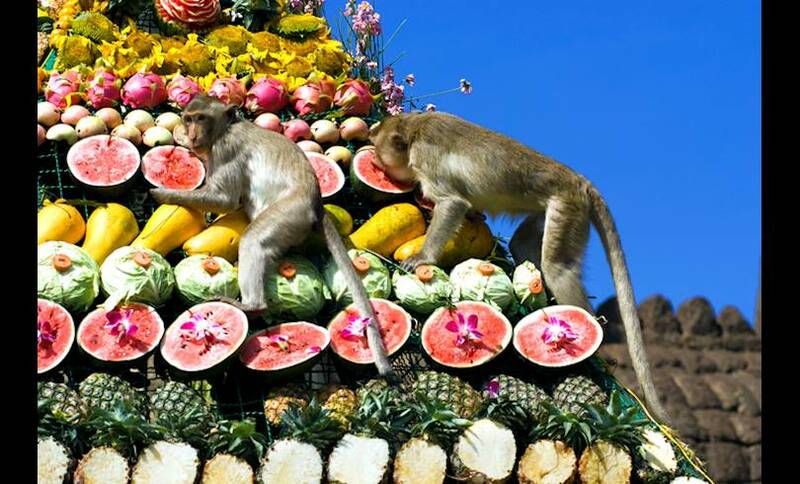 After some monkey-themed festivities and a speech by the Governor of Lopburi, the light-fingered macaques are invited to eat. Despite seeming initially overawed by the thousands of spectators, the monkeys soon pile in, first gorging on the food before erupting into a massive food fight. They then return to their trees for a nap, without so much as a thank you! This is one of Thailand’s quirkier festivals that harks back to the veneration of the monkey god Hanuman and his army of monkeys, which saved Sita, the wife of Lord Ram, from the clutches of a demon.